This Past May Was Wettest Month On Record, Says NOAA : The Two-Way On average, the contiguous United States received 4.36 inches of rain in May. That's 1.45 inches above average and the most since record-keeping began 121 years ago. 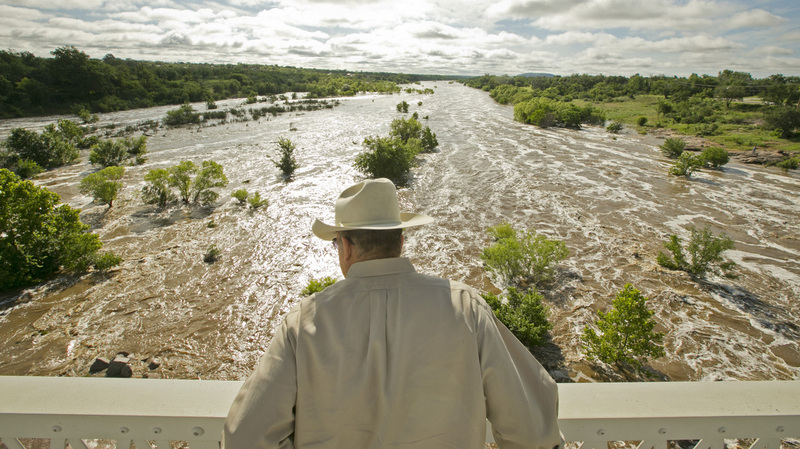 Tex Toler watches the Llano River rise Friday in Llano, Texas, after another round of heavy rains that have brought flooding and deaths to the state. A lot of news came out of the torrential rains that fell across the United States in May. Now, we have hard numbers that put that in perspective: According to NOAA's National Centers for Environmental Information this past May was wettest month in 121 years of recorded history. On average, the contiguous U.S. received 4.36 inches of rain. That's 1.45 inches above average and also the wettest May on record. "For the spring season, the contiguous U.S. precipitation total was 9.33 inches, 1.39 inches above average, and the 11th wettest on record," the NCEI reports. A map showing how rainfall during May 2015 stacks up to the historical average. "Last week, the U.S. Drought Monitor report showed 24.6 percent of the U.S. was in drought, down from 37.4 percent at the end of April. The current drought footprint is the smallest since February 2011."